By this useful article I guide you about SEO Tips and Tricks for Blogger Blog and Website. Now I describe these simple methods if you have read this article you can move your blogger blog page rank high in Search Engines and drive traffic. This article is very useful for new blog Owners and very different from other tutorials.I have tested following SEO tips and tricks are very useful. Blogger Blog is one of most famous blogging platform in the world online. If you want to start your online business it is great way and totally free of cost. I want to inform you that in every second, two million blogs get a real estate on the Internet. So you have to be faster than other millions of blogs out there online. If not, how could you take your blogger of among two millions of blog posts published in each day. Now you ready to get your blogger post on top page ranking of Google Search Engine and other Popular Search Engines. Now I guide you step by step how improve your blogger traffic to take the guidance of following main topics. Blogger Posts are to be Search Engine friendly, and drive traffic it is good practice. The blogger posts can have an awesome quantity of information your readers, visitors and other writers like good tutorials and come to your blogger time to time. The method is to organize the information about your post easily so readers are not scared by the length or amount of your blogger content. Make original contents and do not copy from other Blogs and Websites. For more information read this article How to Create Blogger Post Search Engine Friendly. This tutorial is very informative for new blogger or Website users and get more and more to drive traffic easily. It is very important issue that correct title tag of your Blogger Blog in Search Engines and adjust the title according the rules of Blogger Search Engine Optimization. If your post title tag is not optimized Search Engine friendly you will face more difficulties in Page Rank of Popular Search Engines. Lot of Search Engines preference first word of the entry which is puts on your Blogger. When you will check your blogger post and you will judge that the Blogger name explains first in the title bar of your browser. This process is very disadvantages in search engine results. Luckily it is easy to turn around the Blog name and the post name with an easy tweak. Read more about title tag check my useful article How to Add Blogger Title Tag Search Engine Friendly. This tutorial is more useful for new blogger and Website owners. I could not hide that Blogger regularly makes a permalink based title of the Blogger post. Whenever you make a post in Blogger and you would use technique to build the title carefully. Permalinks should be very short. I think longer permalink creates problems and are not friendly support in Search Engines. It is bear in mind that before publishing of article setup the title of your post because once permalinks of the title has made and then it could not be changed longer. For more information about permalinks read my useful article, How to Modify Permalinks of Blogger Posts. This Article is very useful for new bloggers and Website owners, must be read it with carefully. Meta Tags are creating great role in Blogger. If you have already added Meta tags to Blogger Blog, and make sure that you are well aware and followed the methods as per rule of Search Engines. Meta tags are HTML tags that provide extra information regarding Blogger Blog to the visitors and readers. In the Meta Tags, the description tag provides a small summary of the page content to the visitors. The keyword Meta tags show the keywords and keyword phrases a visitor might apply to find out Blogger Blog. As aggression of Meta tags Search Engines have turned into smarter and no longer place status on keywords to set up page ranking in Search Engines. Though keyword Meta tags are still used by few Search Engines therefore it is very nice proposal to hold them in blogger blog. About Meta Tags read this Useful Article How to Add Meta Tags in Blogger Blog. This useful tutorial about Meta Tags is very high quality and we have added latest methods of Meta Tags, how to use it in blogger template. In these days increasing the demand of Social Media sites everyone like to register Social sites because lot of traffic comes from these sites. I have judged that everybody likes to show Social buttons on their Blogs or Websites really this is very important and perform key role to drive traffic. We create links to popular Social Media sites for the growing of traffic actually it is very good practice such as, Google, MySpace, Facebook, Digg, Reddit, Delicious, Stumble Upon, Twitter, Pinterest, Linkedin and other popular Social Media sites are very famous in the world of Internet. You can get more traffic if you have shared links of Social Media sites with visitors and readers through your Blogger Blog. Another additional advantage of a social Media buttons is that you will be able to recognize visitors movement and Social Media performance on your Blogger Blog. You can share and get Social Media Buttons from some popular sites gets free of cost social media share buttons such as AddToAny , AddThis, SumoMe, Sharexy, and lot more others search on Google it is providing free beautiful and all share buttons which you required. Your Blogger Blog is properly indexing in famous search engines or not, otherwise add Site map of your Blogger Blog with most popular Search Engines. When you will submit Site map of your Blogger Blog properly this is very good way to increase more traffic. Whenever famous Search Engines are not aware from your Blogger address you cannot be success. Now I guide you step by step tips and tricks how you add Sitemap of your Blogger Blog in famous Search Engines, please read following useful tutorials about this, and get more benefits to submit properly Blogger Site map to popular Search Engines with new methods. In my experience I advice that Link your blogger posts each other, and make related posts widget, further make blogger post link in your blogger post body. My first opinion is that take advantage from Blog Directories are very easy way to increase your Blogger traffic. If you want more and more traffic contact with authoritative site owners, lot of owners are keen to add link from their Blogs and sites to others. Another good method I have found during the searching online a good directory named DMOZ, in this directory you can submit your Blog address, it is good source of getting traffic, before submitting your address please check Directory project and sent your Blogger address in correct subject. To see this not only are links take in by search engines, but they also act as a valve on the shoulder to other Bloggers who can easily recognize who is linking to their Blogs. This is may guide them to become new readers of your Blog or to insert links to your Blog. You can get links to other Blogs a step ahead by departure a trackback on the other Blog to let them recognize you have linked to them. Blogs that permit trackbacks will contain a link back to your Blogger Blog in the comments section of the post that you originally linked with your Blog. In this field links one of the strongest parts of your Blog and also sent guest posts. This is very important and main thing is that write original and useful contents for your visitors and readers. If you want visitors, readers come back to your Blogger Blog time to time. In this regard have patience but your written posts are sole and helpful for others. Script unique contents are absolutely the key of success. Do not make duplicate contents from other Blogs, I think this procedure will destroy your coming traffic. The right decision at this point is to write posts in your own words and include your own useful opinions and ideas. Quality posts are the stair of your success in the Blogging world. I have read millions of articles in this regard lot of successful writers emphasized in the importance of quality posts. Search Engines prefer to those which are consisting of best information and profitable for others. Another disadvantage reason is that to avoid your contents from grammar mistakes and spelling errors. Take care with the management of your images because in your written article images give a beautiful professional look to your Blogger Blog. Article of your Blog should be more than 500 words and above it gives more interest to your visitors and readers. I say for your more information and knowledge that frequently short contents missed in Search Engines. If you write your posts frankly for others and use simple and profitable words and you give your own ideas and opinions really you are very lucky and you are successful person in the field of Blogging. Commonly visitors and readers prefer valuable posts if they found real things in your article to see this they will return back to your Blogger Blog. I can not guess how much visits on your Blogger in 24 hours, it depending on your best quality articles. If your visitors and readers judged that your article is duplicate they will not return back on your Blogger Blog. If you want to make your Blogger Blog according SEO generate Keyword Rich contents. If you want to improve your contents in Search Engines choose those keywords in the starting and end of the article. What is keywords read keyword density you will know that how keywords are significant. This is very good technique in your post that you have used important keywords and keyword phrases frequently. One thing is importance that save your post from overload keywords because Google is very elegant enough to distinguish if your pages are beleaguered with keywords and nothing much else. I advice that use Google Adwords will help you quickly and show capacity keywords and rich objects selected keywords paste in Live Keyword Analysis, it will guide you better keyword orders. Another reason is that when you start to write article make sure that opening sentences explains what article is about and includes your keywords and keyword phrases. Your Blogger feeds are very important method to create reliable back links for Blogger and sites are really precious can improve your page ranking in famous Search Engines. In this regard you can obtain help about back links from Blogger Help Article About Back links. Make sure that Blogger RSS feed icons are clearly able to be seen for visitors and readers. You can forward your feed to a feed burning like Feed burner and after that add a chick let to your Blog or site in “Orange RSS feed button” as a result feed is available on click. Add subscription links widget to a sidebar, if you have not burn your feed you can try adding a Subscription Links widget to a sidebar to give confidence to visitors and readers. You will find the contribution Links widget available under the list of gadgets. If you have not burn your RSS Feeds in Feed burner as yest read this useful article How to Burn Blogger RSS Feeds to Feedburner. This Article is more profitable for new blogger and Website owners. Continuously utilize a blend of various headings. More often than not, blog titles are H1s, so never utilize H1s. Post titles are generally H2s, so don't utilize H2s either. Utilize them just once in a while. Generally, utilize a mix of H3s and H4s in your post to indicate a reasonable progression in your substance. I have judged that Heading and Subheading are very useful because search engine prefer those posts which are optimized with headings and subheadings. A grapple content is the content you use to connection to another page, and it is the thing that clients snap to get to that other page. Picking stay content is a critical piece of connecting. Never utilize a solitary word stay content. Continuously utilize an expression. As a rule, a three-word expression is the best alternative. Continuously utilize a catchphrase expression as grapple content. Additionally, remember to never utilize a similar grapple message twice for a similar connection. It is considered as watchword stuffing, and additionally spamming. Regardless of whether on your site or another, dependably fluctuate the grapple content. Submitting your blog to directories such as DMoz increases the number of back links you have, and in turn, your website's rank.More lot of Blogger Directories are available and providing best and free service to add your blog, simple search on Google and chose a popular Directory and register with it and wait for quick reply, after some days you will get more traffic. The rundown of inbound connections on Google Webmaster tools is for the most part significantly bigger than the rundown of inbound connections that can be found utilizing the link. Look inquiry on Google itself. Google is tight lipped about the error. The rundown on Google Webmaster tools incorporates no follow joins that don't pass on site improvement expert to the connected webpage. Then again, the rundown of connections produced as sort inquiry are considered by Google to be "essential" connections dubiously. Google Webmaster tools Apparatuses, and additionally the Google list, appears to routinely overlook interface spam. Once a manual punishment has been expelled. Google Webmaster tools will in any case show the punishment for an additional 1–3 days. After the Google Look Support of the data has been delivered exhibiting that Google Seek Reassure makes information focuses that don't accommodate with Google Examination or positioning information, especially inside the neighborhood seek advertise. Google Webmaster tools is best source of your Blogger or Website to guide you about your site for more information I have written more informative Article How to use Google Webmaster tools Techniques. 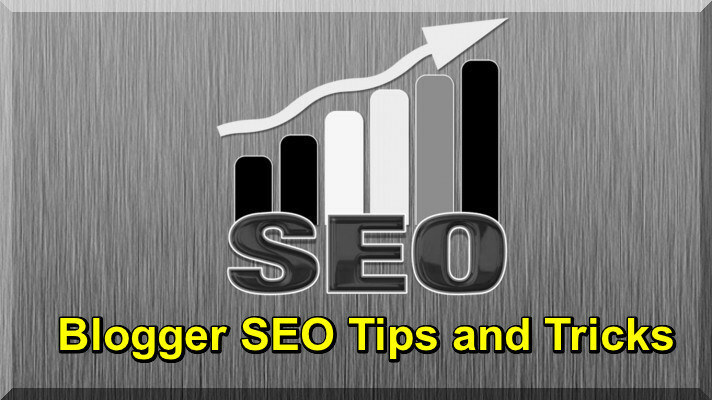 I hope this tutorial will be very useful like other tutorials, and it has been provided very useful information about SEO tips and Tricks for blogger. If you like it please leave your comments.